Zingerman’s Guide to Good Eating is going slowly, not because it’s difficult or tedious, but because it’s the kind of book that is enjoyably savored. Maybe, I’ll post a review next week. In the meantime, I skimmed this book and had culinary success with one of the recipes. Summary: Panini Express: 70 delicious recipes, hot off the press by Daniel Leader and Lauren Chattman has recipes for sandwiches and also for bread and for spreads. The book is smallish and almost square. There are several full color, full page photos. The sandwich recipes are printed on single pages. Some of the spread recipes are two per page and some of the bread recipes take more than one page. We bought a Cuisinart Griddler Jr. recently, so we have been experimenting with paninis. With only partial success, it was time for a cookbook! First up, a Tuna Panini on rye bread. The rye bread was baked in the bread machine following, more or less, this recipe for Sourdough Rye Bread on the King Arthur Flour website. I used the whole wheat sourdough starter that I’ve been maintaining for a couple of years. In order to make use of the fancy Spanish tuna we’ve been buying in 4-ounce tins and to decrease the serving size a bit, I reduced the recipe for the tuna salad. I also substituted fresh rosemary for fresh parsley, since that’s what I had — we liked the change. Preheat the panini press according to manufacturer’s instructions. Gently stir the tuna, mayo, capers, rosemary, and spices together. With this quality of tuna, I wanted to leave the pieces large and chunky rather than mashing it all together. Brush the outside of the bread lightly with olive oil. Spoon the tuna mix on the inside of the bread and top with cheese. Add the upper slice of bread to each of the two sandwiches. Put the sandwiches on the press, pull the top down, and cook until they are browned and crisp, 3 to 6 minutes, depending on how hot your machine is (a little over 3 minutes was enough for us). Carefully remove from the press and serve immediately. We agreed that this was the best panini we have made yet! Besides the sandwich recipes, I really want to try something they call “Pizza Bread.” It’s a flat bread baked right in the grill press so it has the ridges of the grill baked in. It looks very unusual. Appeal: A panini press is required to get the most out of this book. If you have one sitting around, this book should be very inspiring! There are several vegetarian recipes as well as ones covering just about every kind of meat one could imagine in a sandwich and some you probably haven’t thought of yet. There are even a few dessert sandwiches! Challenges: This is Book 8 of the 9 books I challenged myself to read for the Foodie’s Reading Challenge. I will also put this in the link list at Beth Fish Reads for Weekend Cooking. The Beth Fish Reads post is about a beautiful comfort food dish of polenta with mushrooms. BermudaOnion’s Weblog has a review of just my kind of book: Weekend Cooking and giveaway: Nutrition Diva’s Secrets for a Healthy Diet. My library doesn’t have a copy of this book yet, so I entered the giveaway. Leslie at Under My Apple Tree shared a recipe from The Simple Art of Eating Well Cookbook that looks delicious, Weekend Cooking: Rosemary Orange Chicken. Love the griddler, I use mine all the time! The panini sounds so good! SO does that book, will look into it, thanks! Page 82 is Turkey and Stilton with Cranberry-Orange Relish. There’s a photo and it looks amazing! I love tuna salad and eat it two or three times a week in various forms. I’ve never once thought about pairing it with swiss cheese in a panini. As I read through your recipe it just sounded so good. I have to give it a try. Yum! I don’t (yet) have a panini press, so I’m probably not ready for this cookbook. I do have (and use, often!) Lauren Chattman’s COOKIE SWAP! I have a Cusinart full-size griddler so I am all set to make this. I am so curious about the dessert paninis! The tuna sounds yummy. 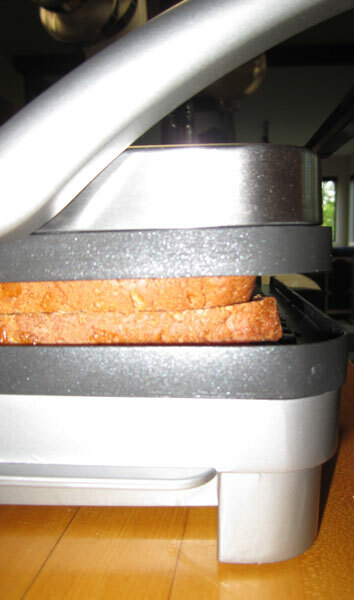 I’ve been contemplating a panini press because they’re just so yummy. I always wonder if my George Forman grill will work but, I’m guessing-no. I made some paninis on my parents’ George Forman grill. The problem is the lid won’t lay flat on top of the sandwich, so all the filling wants to squish out toward the front. But it’s probably worth experimenting with to see if you like the concept before buying a special machine. Just use fillings that aren’t too gooey! I bet my son would love the book and the press! I gwet panini sandwichs at my local coffee shop. They do a great job of a veggie one. Not planning to get one for myself, though I do enjoy reading about the various combinations of fillings.